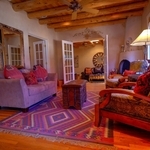 Enjoy one of our twelve, authentically decorated, Santa Fe vacation rentals at Casas de Guadalupe. Originally built in the 1940’s around the time when Georgia O’Keepfe moved to New Mexico, Casas de Guadalupe was constructed using traditional adobe building methods to create 12 detachable dwellings, each with a private entrance. Today each casita has been lovingly restored with all the modern amenities surrounded by the southwestern ambiance of wooden vigas, serene portals, and kiva fireplaces. Each casita offers a unique experience. One and two bedroom casitas sleeping anywhere from one to six individuals. Located three blocks from Santa Fe Plaza, in the heart of the historic district, guests can enjoy overnight stay with family and friends. Enjoy the brilliant azure sky and feel the inspiring soul of the city as you walk, literally only minutes, to the legendary Santa Fe plaza, the railyard district, the Georgia O’Keefe Museum and many art galleries, dining and events. Artist pleasures and cultural adventures abound in Santa Fe all year long. Casas de Guadalupe casitas are just a short drive to the Santa Fe ski basin, the art galleries of Canyon Road, and the Santa Fe Opera. Our casitas are located in close proximity to one another, making it perfect for large family gatherings. Why stay in hotel, when you can stay in a home? The word “Casita” in Spanish means “Little House”. Different from a Santa Fe hotel, our casitas radiate warmth, provide a fully furnished home away from home, and welcome visitors to explore “The City Different” and New Mexico’s enchanting history. Let us help with your arrangements and prove our commitment to personal service. Contact Casas de Gaudalupe, or book online today! Stay at Casas de Guadalupe! Most of our casitas are pet friendly. Casita H is the only casita that we do not allow pets. We do not ask for a pet deposit, but we do ask that you make sure to clean up after the little guys/gals both inside and on the grounds. 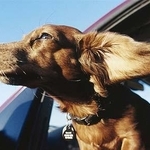 We also ask that if your pets are left alone in the casita that they not destructive or do not disturb other guests. Video above is for Casita H, which is a two bedroom, two bath casita. Sleeps 6. Kitchen: Oven & Stove, Microwave, Dishwasher, Refrigerator, Coffee Maker (filters & coffee provided), Toaster, Blender, Salt & Pepper, Cookware, bakeware, dinnerware, flatware, glassware, for maximum occupancy. Living/Other: Washer & Dryer, Cable Television (no DVD Player), Wireless Internet, Iron/Ironing Board, Alarm Clocks, Hairdryer in each bathroom. Paper Products/Toiletries: Please note we only provide an initial supply of the following for about a week. Anything over that is up to the guest to replace. Trash can liners, dish soap, laundry soap, hand soap, kitchen soap, paper towels, and toilet paper. You will also find light bulbs and extra tools (in Tupperware box) under the kitchen sink. There is absolutely no smoking allowed inside our units. If smoke is detected inside of the unit after your stay, you will be charged a $500 de-smoking fee.